Many of you already have our top selling CorkSport Power Series Short Ram Intake with Turbo Inlet Pipe (that will now be known as the CorkSport Stage Two Power Series Short Ram Intake) in which case you have already made a wise investment, but for those of you that have been saving up for the CorkSport intake, we have just made your lives a little easier! 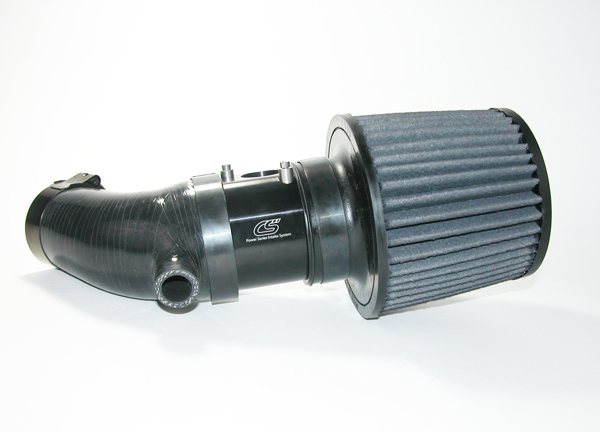 Today, we are releasing our all new CorkSport Stage One Power Series Short Ram Intake! Developed as an introductory package, the stage one intake replaces the factory airbox with an open intake system while maintaining the use of the factory turbo inlet pipe. Unlike our classic CorkSport Power Series Short Ram Intake, this kit does not include an upgraded turbo inlet pipe allowing us to provide this introductory package for your Mazdaspeed. This affordable option for upgrading the Mazdaspeed 3 intake system includes our precision machined MAF housing made from billet aluminum with included air straightener, durable dry flow air filter and custom reinforced silicone connector. This easy to install short ram intake forces volumes of air to your engine through the dry flow air filter and MAF housing and down the silicone connector providing a noticeable improvement in power along with improved fuel economy. In initial testing the CorkSport Stage One Mazdaspeed 3 Short Ram Intake netted peak gains of +12 HP and + 17 lb torque. Choose from a red, blue or black air filter and MAF housing to customize the look of your engine bay and select between polished or stealth black T-bolt clamps to further tailor the look of your intake system. This was developed as an affordable alternative to CorkSport’s number one selling Mazdaspeed 3 Power Series Intake System with included turbo inlet pipe. By adding the CorkSport Mazdaspeed 3 Turbo Inlet Pipe, customers can expect to see an additional 14% improvement in airflow over the stock pipe and significantly decreased airflow turbulence by removing the restrictive nature of the stock pipe with the sweeping curves associated with the mandrel bent aluminum 60mm piping used in the CorkSport pipe. As a kit the intake and turbo inlet pipe can be purchased together or purchase the intake separately and add the turbo inlet pipe when you’re ready. Previous PostPrevious Was that a Mazda?